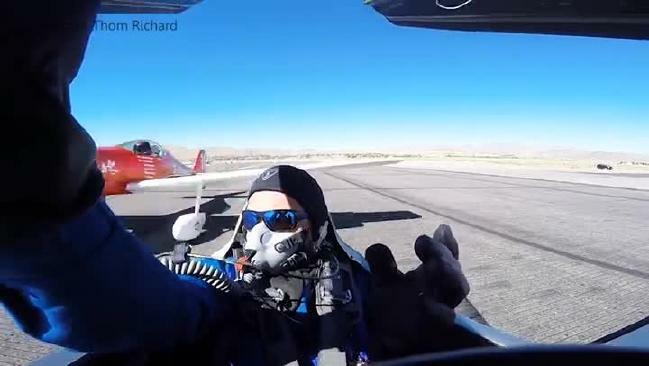 Thom Richard was preparing to take off in the Gold Formula One event at the National Championship Air Race in Nevada on Sunday when his engine started sputtering. The Swedish-born pilot immediately turned his engine off. He opened the canopy of his plane, Hot Stuff, as he signalled to ground crews that he couldn’t fly. However, it appears this message wasn’t delivered to three planes waiting to take off behind him. He hoped the third plane would manage to fly over him. Instead, it hit him with a violent and loud impact at almost 100 km/h. “Three things immediately came to mind. Make yourself as small as possible to avoid further injury until things stop moving,” Richard said.